winter from your home as it will warm, light and create a natural airway through your home. 1. Put a piece of newspaper on the hearth under the open fire door as this will catch most of the debris that falls as you clean the stove glass. 2. 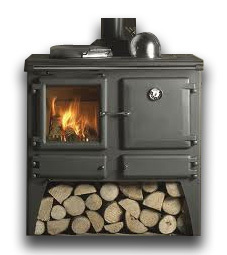 It’s best to start this when the wood burner is still warm to the touch. Get rid of as much of the residue as you can with a slightly damp piece of paper or paper towel. This will help to avoid scratching the glass. 3. Place another piece of damp paper towel in the ashes from the previous night’s fire. Rub this onto the glass in small circular motions. As soon as this gets really black discard it and do the same thing again with a new damp paper towel. Repeat this process until the fire door is clean. 4. When you have removed the entire residue, wipe the door clean with water and then dry with a cloth. This will get rid of any streaks left on the glass. For stubborn streaks the clean water can be substituted with a small amount of vinegar and warm water wiped over the glass. 5. Dry the stove glass off and by the next clean your stove will provide you with the next day’s material to keep your fireplace looking great. 6. Precautions Be careful not to use gritty ash when you are cleaning the door. Use only the soft grey ash from the stove as you can scratch the glass. This will not ruin the door perhaps but in the long run it will make the door harder to clean. 7. Don’t use this method when the fire is in use at full burn as it can burn you pretty badly and stress the wood stove glass. I have been using this method for years and have found it just as good as any of the household products sold for the same purpose. It has the same cleaning properties without both the chemical smell and the cost. It has saved me a lot of time and money cleaning the stove over the years.